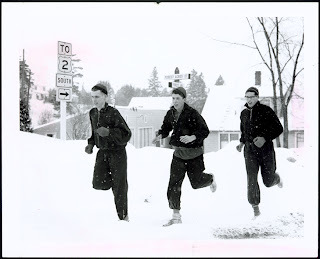 So I thought I would partake in the long musing style of recent bloggership and share a few thoughts on running in quebec, which is a seven hour drive north of Boston. For those historical buffs, quebec will kick off its 400th year celebration. It is the oldest "western" settlement in north america. It is neat top think about how jamestown was founded in the same year (give or take a year) and survives as a field. quebec is booming. in 1609, shakespeare was still alive. French is the primary language, though nearly all know english. Their license plates say in french "never forget" and referes to their loss to the brits. yet, their money has the queen on it. their traffic lights blink green when they switch over... I guess to alert people that it is time to go. there is a pedestrian cycle with each intersection. At this time all sides can cross, no cars can turn or cross... so, one could cross diagonally if one was inclined. It has snowed almost every day up here. they have some intense snow clearing equipment... some which look very intimidating. Many of the machine collect the snow they plow, not just push it... so the plow won't snow in a parked car. genius! They work round the clock, so the city does not shut down... as evident by there not being an runs on the grocery stores. Christine and I had spent our second new years up here (5 years ago). Very romantic. There is an old, walled section on top of a hill that over looks the St. Laurence river. Cannons line the walls, and all the building are made of stone. They will have fireworks tonight. I recommend this place to anyone. Fells like Europe without crossing the pond. I spoke with Jake about a New Year's run. I suggest going to Difficult Run Parking lot off of Georgetown Pike in Great Falls, VA on Tuesday the 1st at 10am. There are great trails and high quality running all in all. We can get brunch after. It would be great to have 6 or 7 people out. Give a shout to the blog if interested. The run is not a race or killer workout. Use it as a nice kickoff for yourself and the new year. People can pair up, do their own thing, etc. and just meet back at the lot at a designated time. Today, a bunch of folks met up in Great Falls, VA for tough training run on hills. We met Chuck Moeser along with Susannah K. on their turf for some fun on rolling soft trails. I had not run out here before and was amazed at the quality of the terrain as well as the sheer beauty. In terms of scenery and hills, it is much more substantial than Rock Creek or anything in DC. This is not taking anything away from Rock Creek but merely pointing out a fact. Living out in the burbs has its perks, I suppose. 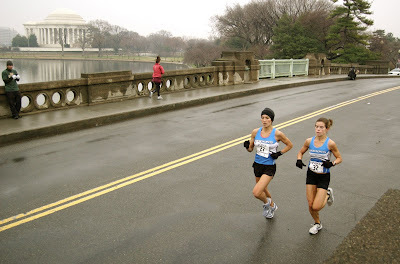 Susannah K. is running the Olympic Trials this Spring and is aiming at a 2:37 time. Chuck M. plans on getting the USA record for the 10K for men in the 55-59 age group, Allen, myself, Robert and Pat are just training hard. The run today was all rolling hills and we did 11.5 of them. Chuck is a very tough runner and pushed us at 6:20 pace the entire time. He starts fast and ends hard. Not bad for someone in their 50s. I am going to begin a new training cycle that focuses on less quantity and more quality. No more than 60 miles a week but each mile will count. As one gets older, time doing meaningful runs is more important than accumulating miles. Chuck M. and some of these veterans who have lasted for 30 years are the one's you should be conferring with. Proof is in their longevity and sustained success over the duration. I have seen a million and one runners come and go from this area who were real strong for a year or two. All sub 33 minute 10K and 16 minute 5K guys. For every 20 of them, there is one or two who last for more than 4 to 5 years, excluding Wardian, who belongs in his own realm of reality. Running is an art meant to be crafted and mastered. Its more about staying injury free and keeping a healthy and positive mental outlook than simply achieving a fast time or beating others. Running and overall physical fitness supports a more balanced soul and a more balanced soul makes someone a more satisfied athlete. Also, always run with people and more importantly, people who are supportive and make you laugh. I am doing a run on sat out at Great Falls in Northern, VA. Its all trails. I am trying to throw some variety in the runs and keep the outlook fresh. For those that are interested in joining in, give me a shout at Max.Lockwood@gmail.com. We can carpool out there and have breakfrast or something after. Its a 20-25 minute ride from the store in G-town. I can meet people at the store at 7:45am, if need be. I plan on going no more than 14 miles or 95 minutes. Others can do what they will and we will wait and so forth. Today I had a chance to catch up with Chris Raabe on a run. Chris ran 2:17 at the trials and is a good example of someone who has really improved over the past 2 or 3 years. Aside from being a talented runner he has quite a bit of knowledge about the art of running. For those interested in pushing it to the limits, you might want to catch up with him on one of his workouts. I think he typically leaves from the store everyday at 3pm for a run. Running is great and it is the reason we have met one another. I will say that aside from Runners/Running, I think that you all are a swell bunch of people with interesting personalities, insights, senses of humor and good hearts. As you all know, not all social circles, sports groups, etc. share these traits. Don't take any of these random meetings for granted. Try and use the runs and running experiences here to enhance your overall life in terms of social networking, getting jobs, helping one another out in different ways, etc. These opportunities do not avail themselves forever and chances, like people, come and go. Goals this year get a better team equipment package, run the club cross nationals, run some indoor races, have a workout training day. Thanks everyone especially Jake for hosting the blog. I AM GOING TO MEET SOME FOLKS TO RUN UP "OLD RAG" AT SHENANDOAH NATIONAL PARK ON SAT. EASY TRAIL RUN. WE GET UP AT 6:AM THOUGH. ON SUNDAY I AM GOING OUT TO LEESBURG TO RUN WITH SOME FOLKS INCLUDING RUNNING LEGEND, CHUCK MOESER. IT WILL BE A BLAST. 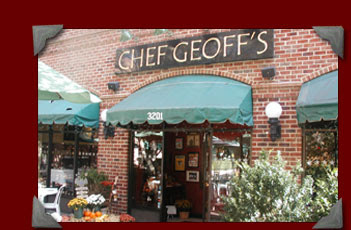 This is obviously not running related, but I am meeting some folks at Chef Geoff's (near American Univ) tonight for $5 burgers and massive 32 oz mugs of beer for $7.95. KLIM believes brew selection is "top notch" and burgers are among the "tastiest in the DC area". I believe both specials end at 7pm. I've seen the training logs some of you use and I was hoping to get some recommendations, specially from those whose features you have found really useful (graphs, charts, shoe mileage tracking, route mapping, etc). Has anybody used www.runningahead.com's training logs? If anyone is interested in running as a team for the GW B-Day 10K in Alexandrea on Feb 16th and doing the RRCA club challenge 10 miler out in Columbia, MD on the 24th of Feb, let me know asap. We need men and women for both. Since I am a loser, don't drink and have no firm plans for New Years, I may run the Kings Street Mile in Alexandria. I hear the course is fast. I might hang around in Old Town after the race. I woke up yesterday with a slight hangover or feeling a bit out of it. Not sure why as I only was out until 2am on Friday and did mostly dancing and talking. So when I woke up at 5:45am I really just wanted to press snooze. Something called FOR THE LOVE OF THE SPORT, got me out of bed, though, and so I made three cups of instant coffee with fake/powdered creamer and downed a snickers bar and said, lets go. I was then off to pick up newbie Matt Herzog. I nabbed him and we started out on our trek to Baltimore to run the Celtic Solstice 5miler. Lucky for us, Matt has some kind of phone that also provides mapping capability. Since we were venturing into uncharted territory, such a device was bound to and did come in handy. As we drove the Baltimore, Matt diligently reviewed our directions throughout to make sure we were heading the right way. Even with such technology, we barely made the race start in time and had to blaze down to the packet pickup tent to get our stuff and get to the starting line. Once we got there however, we had to wait a little bit for guys in Celtic quilts playing bagpipes and drinking beer to mozey on over to the start line and give the official salute to get the race going. While waiting we met up with another member of the team, Laura Ramos, a runner who has started coming to the Wednesday group runs in the eve. As I waited at the line, I noticed some of the usual regulars like running legends Dave Berardi, Chris Chattin and Bob Marino. Back in the day, Marino would battle Jim Hage and Darrell General for all of the local racing titles. 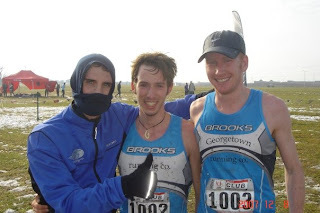 All of these guys are local Baltimore area running regulars who have been winning/running well for years. BANG----- the gun went off and we started. Not knowing what I could do, I ran the first mile in 5:50 and gradually got into the race so that by mile 4 I was passing guys left and right and settled for a 27:24 time. I am happy considering I did no prep for this race. Matt Herzog Prd in 30 and some change and Laura came in # 3 for the women. However, our team finished # 3 overall. In all it was a very positive experience. I have never run in Baltimore before and enjoyed the change of scene. After the race, there was good food and cheer as the Baltimore running community put on a first class show. I highly recommend these races in places an hr or so away as they provide glimpses into other communities and areas that are fun to run in. OK, I know some of you are true to your rituals and such and so, respect is due to such stuff. After reading some of your training logs I said, oh my, true fanatics. None the less, we have a team heading to B-more on Sat morning for a five mile race. I have several folks doing it but need one young and hardy braveheart to throwdown. I spoke with some other teams running it and they have at least one thoroughbred lacing em up. I was young once and would not think twice about such stuff. Even as a dumb old guy, I don't give a damn. Anyway, if someone is so inlclined, no shame need be thrust upon you. Man their website must be jammed. Hopefully it will be easier to register later in the day. Anyways, just reminding yinz to register for Cherry Blossom if you so desire. It will probably be closed by this time tomorrow! Michelle Sikes, who has been a regular/dedicated runner at many of the training runs and has participated as an active supporter, at races, is leaving for her full-time training for the Olympic Trials, begining December, 21st. I propose we take her out for dinner and drinks this sat night(the 15th). I am thinking somewhere in the District and close to metro. Maybe Woodley Park, which is on the Red Line. We can go to Adams Morgan for food and drink or pick something more civil in Woodley. Either way, please send me an e-mail or comment to this post, if you are interested in coming along. Go to the link below to see a few pictures from the mudslinging action in Ohio. I encourage everyone to actively seek out a cross country race such as this one, not too cold and filled with brown sludge to wade through. Pay no attention to times, just jump for joy that your mom is no longer around to tell you not to play in the dirt. A good time was had by all and JJ (Jason and Jake) showed a bunch of the Pacers whats up. Went out and did the Jingle Bell Race this am. First and foremost, our team won! Michelle and Vanessa both ran well for the women and the guys did reasonably well to take the team crown. Not much to write about as the it was the usual out and back Haines Point race. I think I have run a race on this course, at least 100 times so there is only so much one can say. Either you are in good shape and run a real fast race or you do not. I am neither in bad or good shape. somewhere in the middle. My lungs and overall fitness is excellent. The legs are not what they once were in terms of turnover. Maybe that is the aging process doing its thing. We will see. Bottom line is I feel great and never really hurt or felt too much pain. Ran a total of 14 miles today including the run to the race and then the run after(5 miles). Next on the horizon is this little 5 mile race in Baltimore. I am hoping to round up 5 or 6 people to run it. I have never run in that neck of the woods, so I figure I will run the race and add 6 or 7 miles to it and make it a medium/long run adventure in a new scene. If interested, give me a shout. PS. Humor moment of the day was at Mile 1.5 I hear "oh S......T", I look to my side and see Nate Timm staring down at a shoelace come undone. The rest is history. PS2 It was great to see Allen, Peter, the "old man" and his kid, Chris Raabe and others, cheering the team on. thanks for coming out! Results from the meet today are below. The snow and mudd seemed to be a huge factor in the slow times from the race as a whole. With all of that in perspective, the guys looked like they ran real tough... They were not able to score as a team due to my absence. I feel terrible about it... I have been battling a hamstring injury that occurred late last week and on top of that came down sick wednesday night.... Some bad luck... not a shocker with my running career! Good job fellas... Hope you had a fun time out there! The new store is nice and close to the Capital Crescent Trail. For folks who live in Upper Northwest or Bethesda/ Chevy Chase this might be a good meeting spot for runs on weekday evenings other than Wednesday. I ran the Park City Marathon last year. It was quite the weekend. Actually it was quite the 23 hours. From the time I touched down until I left again I was not even in Utah for a full day. The trip was punctuated with a challenging but very nice marathon, a wonderful race director and staff and a great pasta dinner. At the dinner, I was surprised to be asked to give an impromptu speech about Fiddy2. I graciously accepted even though my task was enviable. You see, I had to follow the planned speaker of the night who was not only an Olympian, but also good-looking, witty and charming. I might be one of those things and “Olympian” it ain’t. Chris Waddell was his name and he wasn’t just an “ordinary” Olympian, if there is such a term. You see, in 1988 as a freshman ski racer at Middlebury College Chris broke his back in a freak accident on the hill. Two months later he returned to school and three days short of the accident's one-year anniversary he started skiing in a monoski. Less than two years after learning to monoski he was named to the US Disabled Ski Team. Chris remained a member of the Middlebury College Ski Team all four years, and captained the team his senior year. Well, in speaking with Chris recently, I learned that he is tackling a new challenge. He plans to become the first paraplegic to climb Mount Kilimanjaro. You read that correctly. Rather than have me describe it, check out the video here about Chris and enjoy. 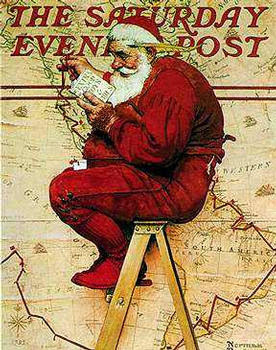 And yes, I do rather enjoy writing blogs about people that make you feel like a whiner. p.s. My current running streak has ended because I forgot my running shoes in my last hotel. Crap. There is a race next Sat in dreaded Baltimore. 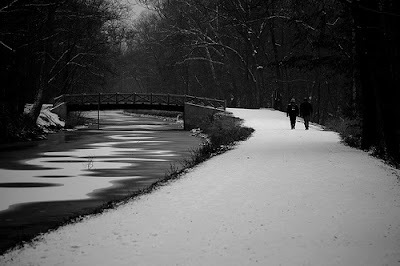 Its a famous 5 miler called the solstice five miler. Its in a hilly park. Lets get a team together to run it. The Baltimore running clubs compete so we can go and throwdown. I have used these races to one, have fun, and two get to know areas of the region I would not normally venture to. Yesterday around 2 in the afternoon, Ben and his wife, Mia, had a son, Ethan. Cheers go out to both of them....do we have a singlet that small? WE ALL THINK YOU ARE WONDERFUL SCOTT______MORE VICTORIES AWAIT! ASIDE FROM THAT, I NEED TO RUN A HARD FARTLEK RUN ON WED OR THURS. MORNING, EVE OR AFTERNOON, PERHAPS. Finally. After 6 years, 10 months, and 11 days I have finally won a race. I ran the Ellicott City Jingle Bell Run/Walk 5k for Arthritis on Saturday. It was a nice single loop course around a lake. I started off behind a kid from a local high school and passed him about 1000m into the race. I pulled away quickly and hit the mile in 5:07 and knew I had the race wrapped up at that point (plus the second place kid would get lost and inadvertently cut the course and be DQed). The last 2 miles I had some time to reflect on what it was like to end my streak of 65 consecutive losses. Life was very different back then. George Bush was moments away from being sworn in as the 43rd President, Alan Webb was moments away from running his first sub 4:00 mile in a city who's skyline was still defined by the twin towers, I thought Kordell Stewart was the answer at QB, and I had yet to try my first alcoholic beverage. I was a fearless and muscle-less 114 pound sack of bones with frosted blonde tips running his 3rd track race of his collegiate career. I didn't know that my 4th track race wouldn't come until 3 years later, after redshirting my first 6 track seasons. I had never heard of osteoporosis or plantar fasciitis or the thyroid gland, I followed my coach's orders with a blind faith, and I thought my victory on that day would be the first of many in a great career. I had alot to think about on Saturday during those final 2 miles. I mostly thought about how I started in this sport and why I continue to do this to my body. I enjoy being out there in the woods and escaping the world; I enjoy meeting new people and learning their story; and I especially enjoy seeing what I am made of. Granted, a 16:42 in a rinky-dink local 5k is not what you would call stellar, but after 65 consecutive losses I will take what I can get. Congrats to all those who did the Gar-Williams half. Great training run. I did something called the Metric Marathon(16.3 Miles) in Columbia, MD this am. I had no idea what to expect as I had neither tapered or done any thinking to prepare for this race. The most I did was make a decision to run 6 easy miles yesterday. Columbia is a nice scenic suburban community 15 miles northeast of the District. Lots of Hills were to be expected. Race was put on by the Howard County Striders. My friend Robert, wanted to run around 6:30 pace and I was thinking I might run with him for a few miles and then speed up. Well, when the gun went off, some cats just flew out. There was this guy from Jake's college, maybe a senior or recent grad who took off with Steve Crane in tow. 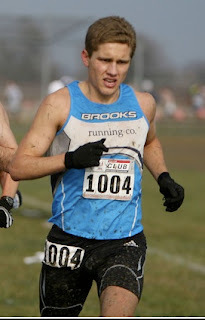 I found out after the race that the college kid pulled up lame at mile 14. Behind them were about 12 other guys and then me. I let them all go for about 2 miles and then I began to crank. Let me just tell you that this initial section of the course, along with next 10 miles or so is all hill. So, as time went on, I was able to gobble guys up until I was by myself in 4th with the 3rd place guy in eye--sight. From mile 6-10 it was 1,2,3, 4 and a bunch of dudes behind me. At mile 10 or around there, this young guy sneaks up to my side. We run together with little surges here and there for the next 4.5 miles or so. At mile 15ish, we are neck and neck when out of nowhere, Chris Farley, comes bolting by. I did not hear or see him and it was just like, wooosh. Until that moment, I was totally content to milk it at a relaxed pace into the finish. However, when I saw Chris, I gave it 10 seconds of thought and then decided to give chase. I blew past my running mate and tried to catch Chris. I was sprinting as we he. I was gaining but he had opened too much of a gap and finished 6 seconds in front. Great tactical race on his part! I am a bit pissed at myself, though. As for me, I finished 4th overall in 1:37 and some change. Good race considering the conditions. I think Crane got the course record in 1:30 and something. For those looking to kill their hammys and quads, this is one to try out. By far the toughest race in the area aside from the marathon and beyond distances. HILLS, HILLS and MORE HILLS.